P.W. Singer is a Senior Fellow at the Brookings Institution; at 34 years old, he's the youngest person ever to hold that position. He's written for or appeared on a wide variety of media, from "60 Minutes" to the New York Times. He has worked for the Pentagon and Harvard University, and in his personal capacity, served as the coordinator of the defense policy advisory task force for the Obama campaign. In his previous two books, Singer foretold the rise of private military contractors and the advent of child soldiers - predictions which proved to be all too accurate. The book is also written in a style that reflects my generation, and is thus a bit of insurgency against the staid, often inaccessible, way that people in my field write on the most important issues of our day. So, with that, I thought it fun to do the “99 Test” in a way that reflects this goal as well. That is, my generation has such short attention spans that when we pick up a book (if we are not downloading it onto our Kindle instead), we wouldn’t just lock in on just one page, but would be more likely flip the pages. 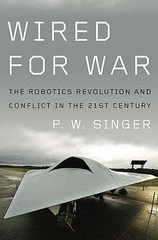 So the following 99 Test includes a clip from p. 99, p. 199, and p. 299 of Wired for War. The p. 99 clip is from a section entitled “To Infinity and Beyond: The Power of Exponential Trends.” It’s a bit of a scene-setter for explaining Moore’s Law and the looming technology changes before us (I also loved having a Depeche Mode shout out in a book about war). The second clip from p. 199 is from a section called “Deep Fried Robots” that explores how even our most advanced technologies are not always triumphant in war. Finally, the clip from p. 299 is from a section called “Un-Manslaughter,” which opens with a discussion of a man (Daraz Khan) mistakenly killed in a US military drone strike because he had the unfortunate luck to resemble Bin Laden and goes on to look at some of the legal complications that are starting to arise when you digitize war. When Moore first wrote on the phenomenon in 1965, a single transistor cost roughly five dollars. By 2005, five dollars bought five million transistors. With lower exponential costs comes greater exponential demand. In 2003, Intel made its one billionth microchip after thirty-five years of continuous production. Only four years later, it had made its next one billion chips. The same changes have happened with the ability to store data. The cost of saving anything from the military’s Predator drone footage of Iraqi insurgents to your old Depeche Mode songs is going down by 50 percent roughly every fifteen months. The causes of these mistakes are often in great dispute. Sometimes the blame is placed on the humans behind the machines. In a U.S. airstrike in 2001, for example, twelve out of fourteen smart bombs inexplicably missed their target by a wide margin. It turned out the humans who had programmed the weapons’ targeting back at the base had punched in the wrong coordinates. Other times, the data itself is bad. As we know from the case of Daraz Khan, as well as all that Iraqi WMD we found, our intelligence is sometimes flawed and unmanned attacks don’t always get the right person. In 2005, U.S. officials said that on at least two occasions, “The Predator has been used to attack individuals mistakenly thought to be bin Laden.” Garbage in, garbage out.